Back during the Golden Age of cocktails, grenadine syrup was a red sugar syrup made from pomegranate juice. It was sweet but also had a complimentary snap from the pomegranate fruit used to make it. In modern times grenadine has become something utterly different offering tremulous, artificial flavors to your favorite cocktail. Now grenadine is a high fructose corn syrup based product with no pomegranate juice to speak of. This is a damn shame because there are a lot of delectable cocktails developed over more than a century that now either fall down a notch or tank completely if you use the standard grenadine you find in the grocery store. A lot of very creative mixologists alive or dead are or would be irate that a quality ingredient they took for granted has been twisted into a mass produced version of pomegranate pablum. That pablum is usually Rose's grenadine, a frightful, gaudy, brassy and cheap concoction that you should ban from your bar. I'm not kidding - Rose's will take a drink over and turn it into a liquid sweet tart. Fortunately now there are much better grenadine syrups you can buy though you will have to pay quite a bit more. We start with Monin Grenadine which a darker, full bodied/cooked fruit profile grenadine. It is relatively sweet but also has enough acidity to balance the sweetness. You can use it in the amount most recipes call for. On the lighter, fruitier side is Stirrings Authentic Grenadine which is fresh and totally natural tasting. It is not as sweet as most grenadine syrups so in your drink recipes you will want to increase the amount of grenadine you are using or reduce the acid. 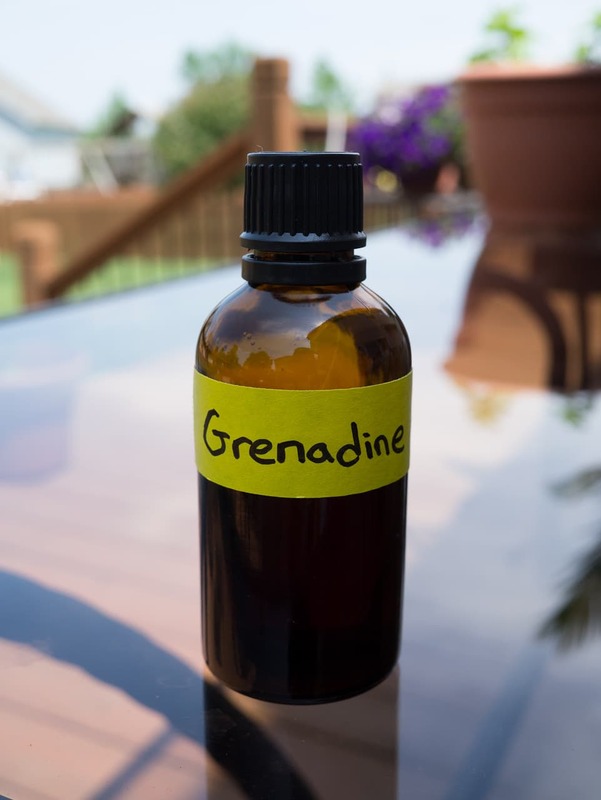 You can also make grenadine syrup at home. And you don't have to go juicing pomegranate fruit because we have a high quality source for pomegranate juice: POM Wonderful. It is available in most grocery stores. Make sure you get the 100% pomegranate original version, not one with other fruit juice added. One 16 oz bottle is enough for the grenadine recipe below and to make the pomegranate molasses used in the recipe. The grenadine recipe below is for a "cold process" grenadine. This makes a grenadine similar to the Stirrings Authentic Grenadine above with a rich but also fresh fruit profile. If you want to make a "hot process" grenadine, you can raise the heat to boiling and cook it down some. Heat pomegranate juice until it is just warm (not hot or boiling). Dissolve the sugar and citric acid in the warm pomegranate juice. Let cool and add pomegranate molasses, orange flower water, and rum. This makes about a pint of homemade grenadine syrup and will keep at least six months in the refrigerator if stored in a sterile glass jar. This grenadine syrup is roughly a double strength syrup and will produce a balanced cocktail when used in the quantity specified in most recipes. The finished product is about 85 calories for 1 fluid oz. The rum is optional but for me necessary. Since this is a cold process grenadine, we are not sterilizing it through heat. Adding the rum helps preserve the grenadine (along with the citric acid). The added alcohol is minimal resulting in a grenadine that is less than 5 proof. And for me, I like to know that even after I haven't touched my homemade grenadine for 3 months, when I get the urge for a Jack Rose cocktail, I'm not going to be disappointed by spoiled grenadine. 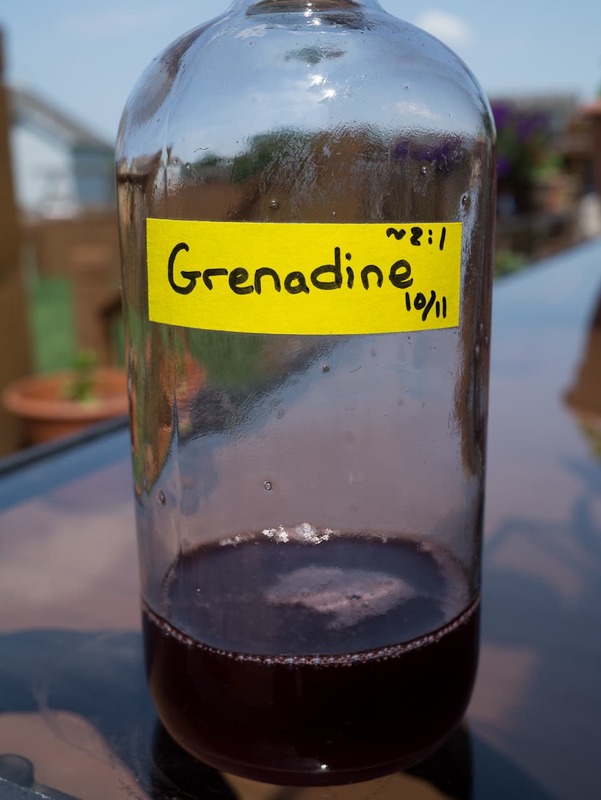 Let us know how your grenadine turns out. There are many ways to tweak this recipe and I'd like to hear what you come up with.